Seeger and friends walked to the chant of "We are the 99 percent" and "We are unstoppable, another world is possible." 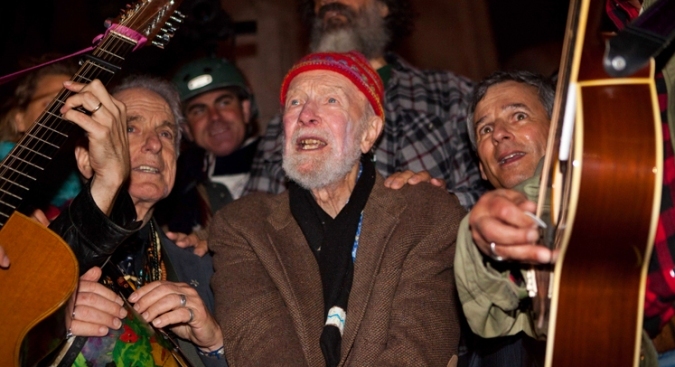 Folk music legend Pete Seeger joined in the Occupy Wall Street protest Friday night, replacing his banjo with two canes as he marched with throngs of people in New York City's Upper West Side, past banks and shiny department stores. The 92-year-old Seeger, accompanied by musician-grandson Tao Rodriguez Seeger, composer David Amram, and bluesman Guy Davis, shouted out a verse as the crowd of about 1,000 people sang and chanted. They marched peacefully over more than 30 blocks from Symphony Space, where the Seegers and other musicians performed, to Columbus Circle. Police watched from the sidelines. At the circle, Seeger and friends walked to the chant of "We are the 99 percent" and "We are unstoppable, another world is possible." Seeger stopped to bang a metal statue of an elephant with his cane — to cheers from the crowd. At the center of the circle, Seeger and Amram were joined by '60s folk singer Arlo Guthrie in a round of "We Shall Overcome," a protest anthem made popular by Seeger. After more singing, Seeger asked for a mic check to tell the crowd: "The words are simple: I could be happy spending my days on the river that flows both way-ay-ays." During the march, the younger Seeger, in troubadour fashion like his grandfather, walked among the protesters playing songs. Amra took up a flute and others enlivened the night protest with the sounds of the accordion, banjos, and guitars. At the front of the throng, marchers held American flags and a large blue flag that said: "Revolution Generation ... Debt is Slavery." Along the way, the crowd sang protest songs made popular or written by Seeger, Woody Guthrie, and others of the protest era. Occupy Wall Street began a month ago in lower Manhattan among a few young people, and has grown to thousands around the country and the world. An Associated Press-GfK poll says more than one-third of the country supports the Wall Street protesters, and even more — 58 percent — say they are furious about America's politics.